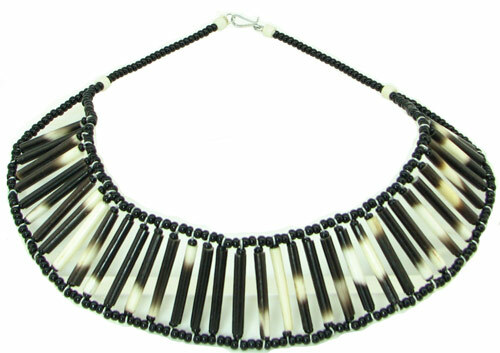 This African Porcupine Quill & Black Bead Necklace is hand made in Kenya. Traditional and very stylish, this necklace lays beautifully at the base of your neck delicately over your collar bone. African porcupine necklaceI bought one of these beautiful necklaces at an african festival last year, and I cant wear it for 30 minutes without getting compliments! Most people are curious and ask me what it is made of, and when I tell them that it is porcupine quills, they are facinated.